That's not to say it is not without its charms, the foremost of which is its stunningly diverse selection of racing alternatives. In speed mode, you'll hurtle through long and accommodating paved racecourses at breakneck speed, the wind buffeting your helmeted head as you negotiate wide straightaways and huge sweeping corners. In supercross/motocross mode, you'll bounce and be bounced over a series of sadistically undulating dirt tracks, thrilling to the inevitable air time you'll experience yet struggling to keep your tires on the ground, where they can translate the power you so dearly want to apply. As a freestyle rider, you'll use ramps, knolls, moguls, and whatever other launching devices you'll find strewn about the vicinity to grab the biggest air and perform the most death-defying stunts before the constantly ticking timer counts down to zero. 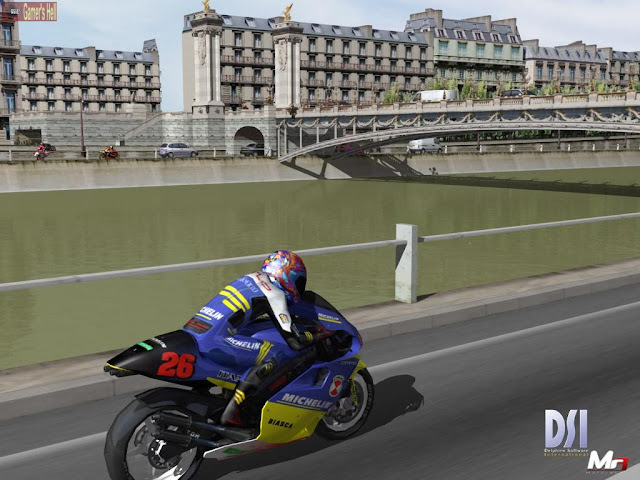 In the trials mode, you'll slowly and meticulously balance and maneuver your steed over an obstacle course designed to topple you to the ground at just the slightest miscue, and in traffic mode you'll blitz through the virtual streets of downtown Paris, trying to outride your single opponent to the finish line without first being beaten into escargot by a frenzied Parisian rush-hour motorist. If all this sounds like fun, that's because it often is. Moto Racer 3's physics model and track designs are simplistic enough for absolute rookies yet not so primitive as to completely alienate experienced players. Its racing parameters are extremely varied and downright exhilarating. Certainly the raw sense of speed of its traffic mode and the raw sense of flight in supercross/motocross are almost worth the price of admission. Almost. The sad truth is that from start to finish, Moto Racer 3 gives the impression that it quite probably should have undergone extensive additional tweaking before being pushed out the door.